Do you spend long hours sitting at your desk? Many of us do these days. Perhaps you’ve noticed that after sitting for a long time, your muscles feel stiff, your joints ache, and nagging pains start to creep into your neck, back, shoulders, and hips. If you must spend a lot of time at your desk, it’s worth carving out a few minutes for some simple yoga poses. Interspersing these shapes and movements throughout the day could help to counteract the negative effects of sitting and bring relief to your body and mind during a long day in your chair. For those of you who think you’re too busy to make time for yoga, think again: the following sequence doesn’t even require you to leave your seat! You can do all of the poses together, or pick and choose as you like and as time allows. Just as Tadasana (Mountain Pose) is considered the home base for the standing yoga poses, so it goes for poses at your desk. 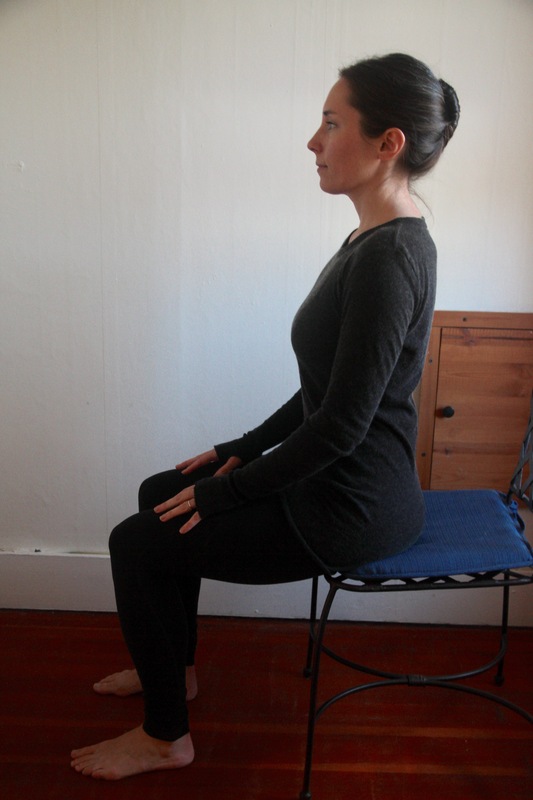 Sitting in Tadasana is the first instruction for each of the following seated poses. This will create a firm foundation from which you can then move and breathe freely. 1. Sit at the edge of your chair. 2. Bend both knees and place your feet on the floor with your ankles directly under your knees. 3. Firmly root your feet into the ground. Feel your big toe mound, little toe mound, and center of your heel all pressing into the floor with equal weight. 4. As you root down through your feet, also root your sitting bones into the seat of your chair. Notice if you feel a sense of grounding from this rooting down. 5. From the roots you’ve created underneath you, begin to grow upward—through your pelvis, belly, spine, and all the way through the crown of your head. 6. In the midst of this rooting down and rising up, rock your pelvis forward and back a few times (first tipping forward on your sitting bones, then back), then settle into a neutral place right in the middle. In neutral, the front rim of the pelvis will neither be tipping forward nor back. Your weight will be evenly distributed between your right and left sitting bone. 7. Also, find a neutral position of the spine—maintaining a natural inward curve at the lumbar spine (lower back), a slight outward curve at the thoracic spine (middle and upper back), and again an inward curve at the cervical spine (neck). 8. Finally, bring your head into neutral by moving it directly above your spine with your chin parallel to the ground, the crown of your head rising toward the sky, and your gaze toward the horizon line. 2. 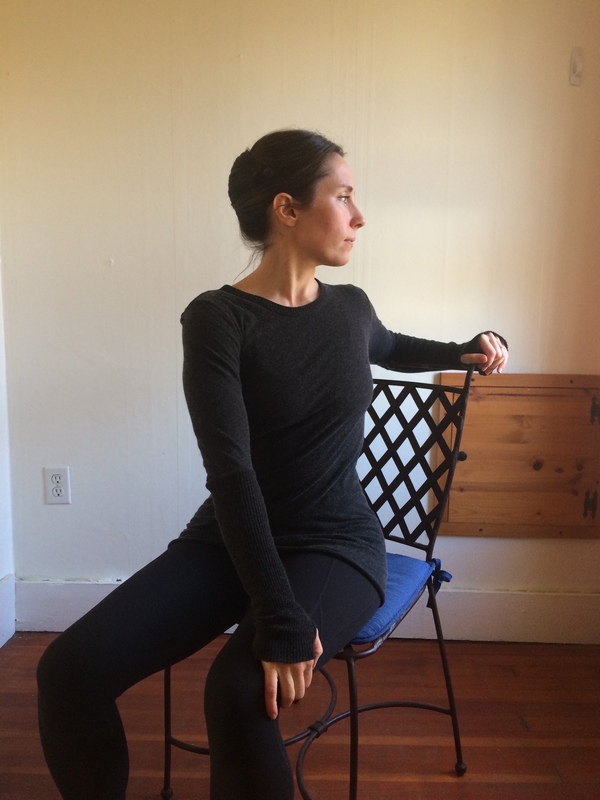 Repeat what you did in Step #6 for Seated Tadasana: rock your pelvis forward and back, moving first toward the fronts of your sitting bones, then toward the back. 3. Allow this movement to reverberate upward through your low, middle, and upper back, so it becomes not just a rocking of the pelvis but an undulation of your entire spine. Your head can naturally follow the movement of your spine. 4. Notice your breathing, and see if you can find some kind of relationship between your breath and movement—perhaps inhaling as you arch your spine into a backbend and lift your chest (Cow Pose) (shown right), then exhaling as your round your spine and lower your chin toward your chest (Cat Pose). 5. Repeat as many times as you’d like, moving slowly and with awareness. 2. Interlace your fingers in front of your chest, and then extend your arms overhead. 3. Turn your palms to face the ceiling and press them upward. Depending on how your shoulders, elbows, and wrists feel here, you may choose to keep a big or little bend in the elbows or straighten your arms completely. 4. With your arms overhead, shrug both shoulders toward your ears as you inhale; relax your shoulders down as you exhale. 5. Repeat as many times as you’d like, then unlace your fingers and release your arms down by your sides. 2. Flexing your right foot, cross your right ankle on top of your left thigh about an inch above your knee. Your right foot will remain flexed throughout steps 3 to 5. 3. You may stay here, sitting upright with a long neutral spine; or, if you’d like to feel more of a stretch in your lower back and right hip, gradually fold forward over your legs. 4. Notice if this position causes any pain in your right knee. If you feel pain, experiment with lifting your right knee closer to your right shoulder, or adjusting the location of your right ankle on your left thigh forward or back. 5. Stay for several breaths, observing sensations as they arise. You could imagine you are breathing into sensation, and notice if it shifts or changes as you stay. 6. Repeat to the left. 2. Root down into the chair through both sitting bones, while simultaneously lifting up through the crown of your head towards the sky. 3. Move your right hand across your body and hold the outside of your left thigh. Place your left hand on the back of your chair. 4. Inhale as you lengthen your spine; exhale and gently rotate to the left. 5. Your head can either follow the direction of the twist or, if that causes tension in your neck, turn your head a little less and find a position that feels comfortable for your neck. 6. Stay for several breaths. 7. Repeat to the left. More tips on this topic from writer Christine Malossi and YogaUOnline - 6 Poses to Counteract the Effects of Sitting. 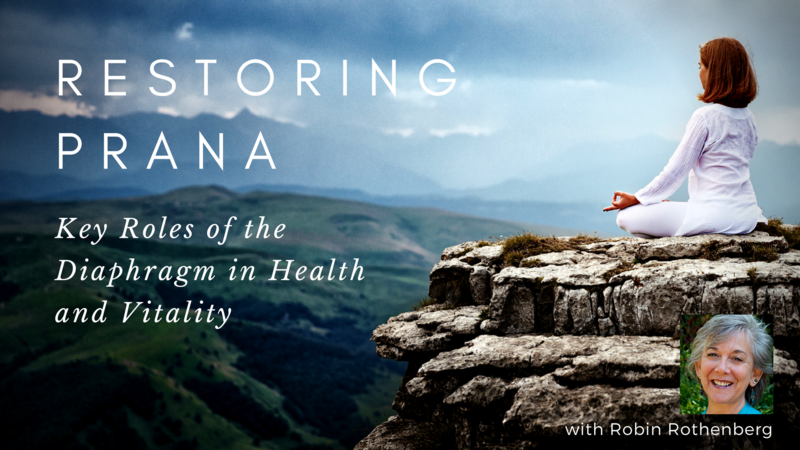 Study with YogaUOnline and Robin Rothenburg - Restoring Prana: Key Roles of the Diaphragm in Health and Vitality. Christine Malossi began practicing yoga in 1999. Based in New York City, she offers an alignment-focused, slow Vinyasa practice that cultivates awareness and equanimity. She is currently enrolled in an 800-hour course on the History, Literature, and Philosophy of Yoga (taught by Brenda Feuerstein, designed by the late Georg Feuerstein). 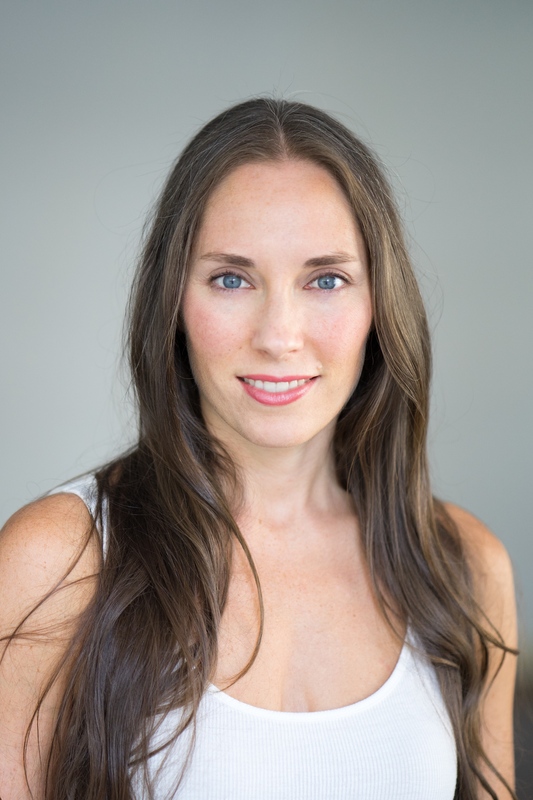 Christine is a Registered Yoga Teacher with Yoga Alliance and has additional certifications in Therapeutic Yoga, Restorative Yoga, Accessible Yoga, and Functional Anatomy for Movement and Injuries. She attended the University of Pennsylvania and NYU and also spent many years studying classical ballet. Find her at christinemalossi.com.